What others have said about IL Baronello Vino Cotto. The dessert for the party last night was fantastic! 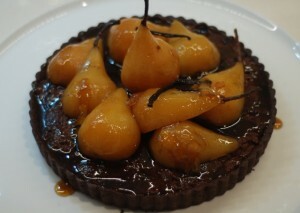 It was a chocolate frangipane tart with pears poached in Vinocotto. Everyone loved it. I had to cater for some coeliacs so the poached pears on their own with some whipped vanilla cream were delicious! Thank you once again for sending me the bottle of your beautiful Vinocotto. A beautiful and unique flavour and very consistent. The Vincotto really added a delicious flavor to the poached pears. I made the “duck breast with(out) figs” too. Beautiful. I’m looking forward to trying out more of your recipes with this wonderful ingredient. I love using Vino Cotto with organic fruit, vegetables and meat. Vino Cotto is one of the best food products on the market. It’s a staple in my pantry. I first heard of IL Baronello Fig Vino Cotto in Townsville on a business trip. The hotel I stayed at had used your product on sourdough bread, with feta and heirloom tomatoes. Right away the crisp and tart flavour came through the soft and savoury ingredients, and the chef was kind enough to tell me of your product range. I hurriedly ordered a 250ml bottle of fig vino cotto for myself, and it didn’t even see 6 months! I use it on everything, sprinkled over a home made lamb pizza, drizzled over a bowl of raspberries and cream, as a key ingredient in marinades, over deserts, and sprinkled on open grilled turkey sandwiches. The flavour is subtle and delicious, and can be used to bring magic to almost any dish! It was absolutely divine – so smooth and exactly what I was looking for, even better than the one my Father used to make. I had it delivered to my Son’s house and my daughter-in-law (who is Australian) was holding it for ransom. It was lovely doing business with you and will definitely be ordering more Vino Cotto in the future. I ran out quite a while ago and tried to live without it but after shaking the last of the complimentary bottle on my salad last weekend I thought I had to put the order in as salads and especially strawberries are not the same without it. It is the Royals Royce of Vino Cotto. Your Vincotto took me back to my child hood. Nostalgia never dies. I have cooked several dishes with your Vino Cotto and the flavours were amazing. Made the Masterchef cheesecake with macerated berries with Vino Cotto Quince. It livens up my flavours so much. I made the Pannacotta recipe…beautiful!! What a fantastic product, love the flavour. My brother bought me 6 bottles after trying the samples. I absolutely love it and have had a great time experimenting with the recipes. I have also given some to a friend who loves to cook Mediterranean and Middle Eastern food who has had great success. I use the Apple Vincotto when making an apple tart. I slice the apples and instead of covering them with lemon juice to prevent browning I toss them in the vincotto as it sharpens the apple flavour. I have also been known to use a pastry brush to sweep a little of the original over puff pastry when I make a pie from left over cooked chicken. PS. A small amount in a little dish of olive oil provides a interesting alternative to balsamic vinegar for dipping bread. All the best. Try it for yourself – Click Here to Buy Online Now.